All expeditions require planning for all eventualities right down to the tiniest detail. First comes months of training, figuring logistics and gathering the right equipment. Training consists of long endurance mountain hikes with heavy packs, aerobic exercise, weight training and mental preparation. Extreme isolation is an accepted feature of many desert regions. As a desert hiker you should plan for total self-sufficiency with the ability to get yourself out of tough situations. Preventive medicine is an important aspect of expedition planning. Up to date immunizations are required according to prevalent regional diseases. One often overlooked health consideration is attention to dental problems that could prove painful in remote areas. Deserts are known for their lack of water. Never ration water. In the dry, hot desert air, the human body loses water through sweating and with every breath. Drink regularly and abundantly even if you are not thirsty. Sipping water does not supply the brain and vital organs with enough quantity. People have been found dead from dehydration with water still in their canteens because they rationed their water in the belief that sipping a little now and then would be sufficient. Always plan to take more water than you think you will need. Never travel away from camp for more a quarter of a mile without at least a quart of water. A good rule of thumb is a minimum of one and a half gallons of drinking water per person per day. Filter all water or use water purification tablets. DUCT TAPE – We always take an ample supply of duct tape wrapped around cardboard. In addition to removing cactus spines, it's great for repairing equipment, and even repairing leaks to water containers. LEATHER-PALMED GLOVES – Invaluable in heavy cactus country, or when traversing rocky desert slopes, or digging for water. They can prevent cuts that might become infected. A signal mirror is excellent in sunny desert conditions and its flash can be seen for miles - especially from the air. Even in light cloudy conditions a mirror produces a reasonable flash of light. We have sometimes carried flares if we are walking across an extremely remote area with little vegetation. Flares must be used with caution as they can cause fires that sweep across areas of dry vegetation. A high-pitched backpacking whistle is a permanent part of our emergency equipment and would be heard by a ground search party. We use a bright colored tent and sleeping bags that can be spread out to make us visible from the air if we have to be found. We also wear bright shirts. Although we have never had to be found, it is a comfort to know that we have thought of the details just in case. There are GPS tracking devices that can be carried that automatically transmits your position every few hours to a base camp. It is also possible to carry a satellite phone from which you can phone or text messages to a base camp. Newer technologies allows iPhone connectivity to satellite email service. Do not rely on a cell phone. In remote areas cell phone service is spotty or non existent. Fires can be started by the valuable 'friction method' of using only two sticks and your hands to start a fire. It's a good idea to pack the two sticks in your survival gear bag and practice starting fires before you go, just in case. We use a topographical map, satellite map, compass and GPS. These days it is certainly advisable to take along a personal satellite-based tracking device. These small units work almost anywhere on the globe in areas where cell phone service is not available. They can send emergency signals to call for assistance if needed, giving your precise location so someone can find you. We use foods that are lightweight and quick and easy to prepare. Dried or freeze dried foods work well in the heat and need no refrigeration. Leave any food at home that might become a melted blob in the daytime desert heat. Always remember to store food in containers and in places where animals can't reach them. 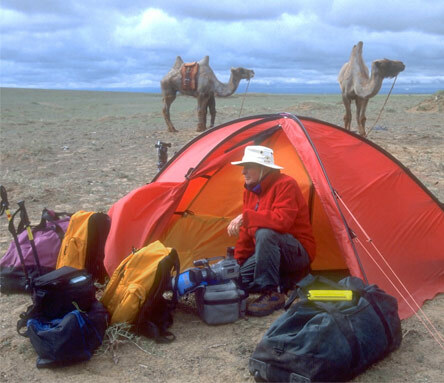 At night the desert comes alive with creatures looking for food; we take everything edible inside the tent with us. FIRE & COOKING We always use a compact, easy-to-use camp stove. It reduces our impact on the desert wood supply. We take two camp stoves and keep one as a spare in case one fails. I In addition you will need waterproof matches, a cigarette lighter, flint and steel fire starter. However in case of emergency, always use down or dead wood for fires. Standing dead trees, general vegetation and cactus provide scarce habitat for desert wildlife. Fire can be very destructive if not respected. Unless you are in a wilderness area with no restrictions always use an existing campfire site when available. To protect the environment never build fires in any area where campfires are forbidden. Rocks don't make good fire rings. They occasionally explode when exposed to heat because of pockets of moisture or volcanic gases trapped within the rock. Also the black and charred rocks become an ugly blemish on the landscape. A better plan is to use a fire pit. Dig a hole about 10 inches deep for the fire to sit in. If a brisk wind comes up, or when you leave, you can quickly fill in the pit to prevent the accidental spread of fire. Even if you are traveling in the most remote, isolated desert in the world, always make sure your fire is completely dead before leaving. Throw water and dirt on the hot coals and fill in the fire pit. Preparedness is the brother of survival.